A contusion is no more than a bruise. A cortical contusion is a bruise to the the brain (the cortex). A cortical contusion is often called a hematoma. The problem with hematomas is two fold: First, a hematoma involves the collection of blood outside of blood vessels, which is toxic to neurons. Second, a contusion also increases the amount of fluid within the skull (brain swelling), thus increasing intracranial pressure (ICP). See our page on Neuropathology for more about the dangers of increases in ICP. Relieving the increase in pressure from a hematoma is one of the primary goals of neurosurgery after severe brain injury. Efforts to intervene in cases of brain swelling may involve removing a portion of the skull, by creating what is called a “brain flap.” A brain flap takes the lid off the pressure cooker, so to speak, and allows the brain room to expand. The surgery to make a brain flap is called a craniotomy or a craniectomy. For more on craniotomy and craniectomy, click here. An epidural hematoma is a hematoma that occurs between the dura and the skull. Subdural hematoma is a hematoma that occurs between the dura and the brain. The brain is divided into two hemispheres. When seen on a CT scan, the hemispheres are quite symmetrical. When seen from above, a reasonably straight line can be seen between the two sides of the brain. If the brain is swelling on one side, it pushes one hemisphere across this center line. 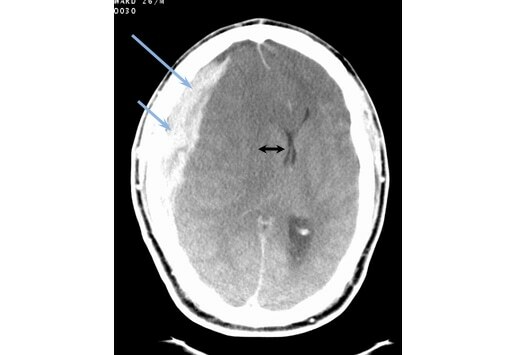 This is called a “midline shift.” A midline shift is one of the most obvious evidences of brain swelling that can be seen on a CT scan. A midline shift can be particularly dangerous as it may be accompanied by compression of the brain stem, which can be fatal. For an example of a midline shift, click here.